LVIV, Ukraine -- The late Polish President Lech Kaczynski, killed with 95 other national leaders in an April 10 plane crash in Russia, had family ties to Ukraine. 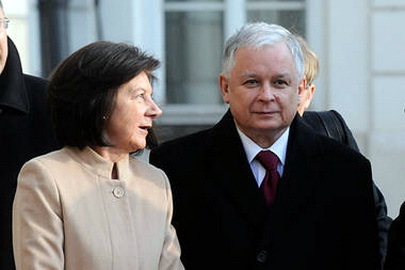 In this March 15 photo, Polish President Lech Kaczynski and wife, Maria, stand in front of the Presidential Palace in Warsaw. Both were among 96 people killed in a plane crash this weekend. Unknown to most Ukrainians and Poles, the late president has two cousins living in Ukraine – Volodymyr Mokhnachov from Poltava and Yury Kuzmyn from Odessa. Mokhnachov’s father, Yaroslav, and Kyzmyn’s mother, Valentyna, were siblings to the Polish president’s mother, Jadwiga. The family was torn apart during World War II, Mokhnachov told the Kyiv Post on April 13. Both men will attend Kaczynski’s state funeral, which will be held in Krakow, Poland, on April 18. As children, the Kaczynski brothers saw their Ukrainian cousins often. As their political fortunes grew in Poland over the years, the visits became less frequent. In recent times, the cousins usually saw each other twice a year and the Polish president made several private visits to Ukraine. Mokhnachov said he learned of Kaczynski’s death about 40 minutes after the presidential plane crashed near Smolensk. The Polish president was killed early on April 10 en route to a service commemorating the 70-year anniversary of the Katyn massacre, in which more than 20,000 Polish officers were killed by the Soviet secret policy in the Katyn forest in western Russia. All 96 people in the presidential entourage, including some of Poland’s top military, political and religious leaders, perished in the crash. The pilot of the TU-154 aircraft had been trying to land in dense fog and investigators have suggested that human error may have been to blame. Polish First Lady Maria Kaczynska, traveling with her husband, was also killed. “I tried to call Lech and then got the signal that the call couldn’t get through. It was a shock. We had hoped he had survived,” Mokhnachov said. Mokhnachov said the president’s mother still does not know of her son’s death; Jaroslaw made the decision not to tell her. “She is ill and finally getting better,” Mokhnachov said. Jaroslaw Kaczynski had also been slated to board the flight that took his brother’s life, according to Mokhnachov. But, at the last minute, he decided to stay with the twin brothers’ mother in Warsaw.